Angels Camp – Nov. 21, 2017 –Angels Camp residents and community leaders, Anne Forrest and Bob Fienberg will be the Grand Marshal in the 27th annual Angels Camp Parade of Lights Nov. 25 beginning at 5 p.m. in historic downtown Angels Camp’s Main Street. 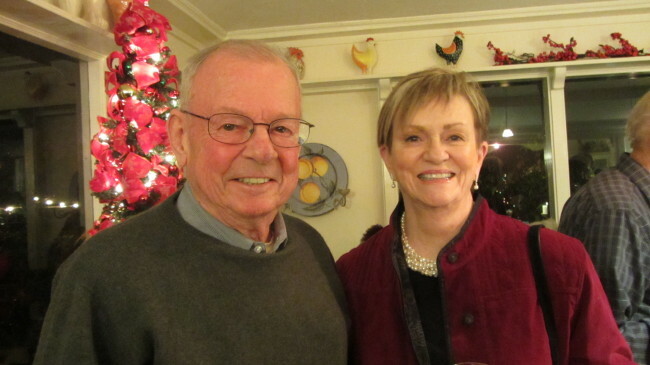 “We’re really excited that Anne and Bob will be honored for all the volunteer work they have given the community over the years by being our Grand Marshal this year,” said Marilyn Smith, secretary of Angels Camp Business Association and this year’s Christmas coordinator. ACBA annually hosts the parade and the Angels Holiday Open House the Saturday after Thanksgiving. Anne Forrest and Bob Fienberg retired to Angels Camp in late 2002 after years of corporate communications consulting work in Asia. Bob had grown up riding horses in southern California and spent his summer vacations during high school and early years of his career working at ranches and riding feed lot pens in the Texas Panhandle. His goal in retirement was to have a small ranch with horses and cattle and fences to mend. The old Bernasconi Family home on the Tryon Ranch off Vallecito Road was on the market and fit the bill. He soon joined the crew helping rancher Tom Tryon during round-ups, brandings, and cattle drives. In 2006, Bob joined the Calaveras County Sheriff’s Volunteers and to date has contributed over 5,000 hours of service, becoming a sergeant in 2013 in charge of volunteers at the Copperopolis substation. In addition to patrolling and community support duties, the Sheriff Volunteers attend many of the events around Calaveras County including the Mark Twain Wild West Fest in Angels Camp and activities at Frogtown. Bob’s career began as a journalist for United Press International (UPI). He then turned to media relations for United Airlines in New York and Chicago, Bank of America and the Federal Reserve Bank of San Francisco. The Bank of America period included several years as head of Bank of America’s public relations and advertising for Asia Pacific, based in Hong Kong. Anne spent over 21 years in Hong Kong where she led the Greater China operations of an international public relations firm before starting her own regional corporate communications firm – Forrest International Limited — in 1991. She and Bob met through a professional association in 1984 while Bob was with Bank of America. In 1996 Bob returned to Asia and joined Anne in her business. In 2000, Forrest International was purchased by Golin Harris International, and Anne and Bob retired at the end of 2002. Once settled into retirement, in 2004, Anne purchased the Cornerstone Professional Building in historic downtown Angels Camp, and then became involved in the Angels Camp Business Association and various other community activities. In 2005, Anne was elected President of ACBA and served in that capacity for three years. During her tenure, she helped launch the Angels Camp Farmers Market, Taste of Calaveras, members mixers, semi-annual sidewalk sales, and the flowering barrels in the historic downtown. She has served on the ACBA board since 2005. In 2007, Anne attended a Calaveras Visitors Bureau workshop about developing tourism destinations and heard Roger Brooks of Destination Development Inc (now Roger Brooks International) of Seattle, WA, talk about how cities and areas can become real ‘destinations’ for visitors. Seeing the potential for Angels Camp, Anne worked with the City Administrator to secure a grant for developing a plan for Angels Camp – to be the mountain sports capital in the Sierra. That plan was approved by City Council, and Anne then chaired the Brand Leadership Team that was appointed by the Mayor to follow through on the Plan. When the recession hit, it became obvious to the Brand Leadership Team that Angels Camp needed a broader economic development program. In 2011, Destination Angels Camp Development Corporation was incorporated and became a Public-Private Partnership with the City of Angels in April 2012 to handle economic development for the city. She has been on the board of DAC since its founding, serving as volunteer CEO and now as Secretary. Anne has served on the City’s Museum Commission since 2007 and helped set up the Angels Camp Museum Foundation that raises funds for Museum projects. In 2011, Anne helped organize the City’s celebration of its Centennial as an incorporated city – the only one in Calaveras County. That milestone saw a number of events during 2012 including the Fourth of July Picnic in the Park and the day-long Centennial Celebration on Main Street in the historic downtown – the first day-long closing of Main Street in over 50 years. The success of the 2012 Centennial Celebration led to an annual fall festival, first called Gold Rush Day and in 2016 the Mark Twain Wild West Festival. Anne chaired the events and this year co-chaired it with Debbie Ponte. In 2016, she worked with local author Jim Fletcher and Monika Rose of Manzanita Press to produce the Mark Twain ’88 Days’ posters now displayed in windows throughout the historic downtown. One of Anne’s proudest achievements is the American flags that fly along Main Street on public holidays. In 2012, she worked with Tad Folendorf and Tony Tyrrell, chair of the Angels Camp Veterans Memorial District, to get the District’s financial support to purchase over 100 flags and poles to line the full length of Main Street and for replacements since then. The City’s Public Works Department handles the hanging and storage of the flags. Anne and Bob married in 2005 and between them have seven sons and two daughters, 15 grandchildren, and six great grandchildren scattered throughout the world, plus a dog, cat and two horses. They love travel, history and foreign crime and detective TV series.